Legacy Planning is all about preserving and passing wealth to future generations. It is a process designed to articulate, create and implement a family wealth plan that is consistent with your values and wishes. This process incorporates the strategic transfer of wealth and prepares your beneficiaries to take their turn in benefitting from the wealth you have created. Do you want to leave an inheritance or a legacy? Two of the greatest family fortunes in history were created in the 19th Century. The lessons learned are clear to see. One family thrives and prospers to this day. The other collapsed. Cornelius Vanderbilt created one of the greatest fortunes in world history, valued at his death at $100million. He left 95% of his estate to one son and divided the rest among his eight daughters and his wife, leaving a tiny portion to charity. Four of his children contested the will and one ultimately killed himself over the escalating feud about the financial inheritance. Confirmation of that view came only forty-eight hours after Cornelius’ death when one of his direct descendants died penniless and within seventy years of his passing, the last of the ten great Vanderbilt Fifth Avenue mansions in New York City was torn down. Cornelius employed a legion of attorneys and accountants. In fact, his planning was based entirely upon financial planning and estate planning. He did not consciously prepare his children to receive their inheritances, create a pattern of communication amongst the family, or organise them for on-going success. Consequently, when the Vanderbilt family held a reunion in 1973 there were no millionaires left among them. The story of the rise of Europe’s Rothschild family in the 19th and 20th Centuries is far more than a tale of banking or politics. It is also the story of how one family has intentionally prepared and organised its children to be strong, independent and successful on their own, apart from the family and its vast fortune. The family first rose to prominence in the late 18th century under Mayer Amschel Rothschild, and, by the time Sir Nathan Rothschild came to lead the family’s enterprises at the turn of the 20th century the name Rothschild was synonymous with banking and finance. So great was their power that on several occasions the House of Rothschild, as it came to be known, actually bailed Germany and England out of economic catastrophes that could have led to their collapse. The Rothschild family philosophy on passing inheritances from one generation to the next is very different from Vanderbilt’s. They actively mentor the children. For example, they establish ‘family banks’ to lend money to those children who want to start businesses or pursue other careers and they monitor and advise the ventures in which the children participate. At the annual family gatherings (which have been held for over 200 years), the values which have sustained the family for generations are affirmed even as their vision for the future is sharpened and clarified. As part of that vision, the family supports a programme of philanthropy in the Arts, Medicine, Science and Education. The Rothschilds not only utilised Financial Planning and Estate Planning, they incorporated Legacy Planning, which prepares the heirs to receive their inheritance. Building on that very stable platform has been the key to keeping individual family members and the family as a whole, unified, strong and prosperous for generations, no matter what is happening in the world around them. We have identified a five-stage process of legacy planning which will deliver a bespoke strategy for you and your family. 1. Identification of personal assets and those in your broader estate such as assets owned jointly or owned by trusts or companies. 2. Identification of potential risks including, for example, your early death or the possible divorce or bankruptcy of a beneficiary. 3. 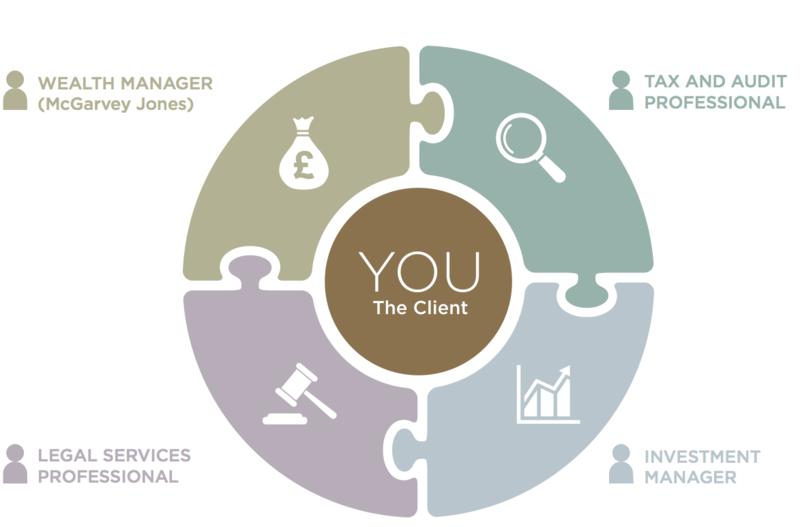 Build a team as each step is a multi-disciplinary exercise that usually will require the co-ordinated involvement of your solicitor, wealth manager and accountant. They must be willing to work collaboratively to ensure that your needs are met. 4. Design and implementation of a plan that incorporates all of your assets and takes into account flexibility to accommodate future changes, investment risk mitigation, tax efficiency and succession issues. 5. Review plan on a regular basis to ensure that your needs and requirements are still being achieved by the plan in place. The legacy planning team at McGarvey Jones will work with you to help ensure that your assets and family are protected. We can implement strategies to ensure that future generations continue to benefit from your legacy. We work with other specialists so if we are not the best people to help you we will introduce the people we trust who can.